Front load washers offer big advantages over their top-loading counterparts. These advanced appliances allow fine control over temperature settings, smartphone-enabled control, and the ability to handle large loads. Like any machine, though, front loaders require maintenance to stay healthy and last a long life. The following are four quick tips to ensure a happy front load washer. When the load is complete, remove the contents and leave the door ajar to promote air circulation. A closed up machine will grow mildew and mold, which will stink up future loads. 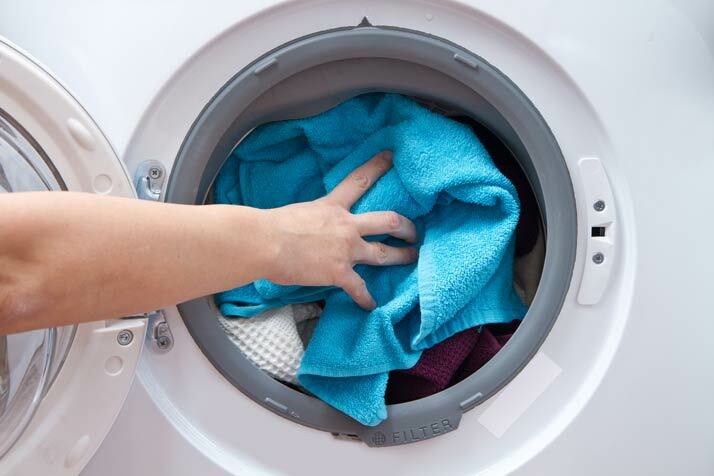 Leaving damp clothes in a closed machine will result in musty clothes, an odor that is difficult to eliminate. Front load washers require special, high-efficiency detergents. A regular detergent makes more suds, which can leave a residue film on the hoses and drum, promoting mold. This film may also electronically or mechanically damage your machine, potentially voiding your warranty. A front load washer uses less water, and thus requires less detergent. Be sure to purchase only detergents labeled "HE", for high-efficiency. Use only the recommended amount of soap. Too much soap is not better in this case. Because front loaders maintain a higher rotational speed than standard top loaders, the machines may vibrate. Consequently, it is critical to carefully load your machine, especially when washing large or heavy contents. Therefore, be sure to set up your washer on a flat surface, and adjust the leveling feet that came with your model. Sorting clothes manually can be laborious, but you can save time and eliminate the frustration of programming customized cycles for each type of load by customizing your programming. For example, if you wash your whites on a setting that is higher than the default temperature, you can "favorite" this setting to reuse it weekly.